La’o Hamutuk ho FONGTIL sei realiza enkontru públiku ida ho títulu “Orsamentu Estadu ba ne’ebé de’it no oinsá ho previzaun ba oin?” no konvida ema hotu, inklui reprezentante husi Governu, sosiedade sivíl, akadémiku no ativista sira. Ho objetivu atu fahe informasaun kona-ba Planu Orsamentu ba kada Sektorál husi OJE 2019 nian no mós hetan perspetiva di’ak husi partisipante sira. Ita boot bele hetan informasaun preliminariu kona-ba OJE 2019 iha ne'e. La'o Hamutuk and the NGO Forum will hold a public meeting on "Where is the State Budget going, and how does it envision the future?". We have invited everyone, including representatives from Government, civil society, academics and activists. The objective is to share information about the Budget Plans for each Sector in the 2019 State Budget, and also to hear perspectives from the participants. You can read preliminary information on the 2019 State Budget here. 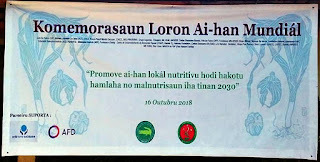 Iha eventu komemorasaun loron mundiál ai-han 2018, HASATIL nu’udar rede nasionál ne'ebé servisu ba hametin no promove agrikultura sustentável iha Timor-Leste hamutuk ho ninia membru hotu iha munisipiu 13, hakarak louva agrikultór sira hotu iha Timor laran tomak ne'ebé kontinua servisu maka’as hodi halo produsaun ai-han ba ema hotu, maski hasoru dezafiu no problema oi-oin. HASATIL mós hakarak aproveita loron importante ida ne’e atu bolu Governu, Parlamentu Nasionál, Prezidente Repúblika no ba Públiku tomak nia atensaun ba situasaun real iha Timor-Leste liga ba produsaun ai-han iha rai laran, no dependénsia ba importasaun ai-han husi rai li’ur. Timor-Leste nia situasaun produsaun ai-han sei nafatin laiha progresu boot hafoin liu tiha tinan 15, maski governu Timor-Leste no ajénsia dezenvolvimentu sira gasta ona osan barak ba setór ne’e. Dadus estatístika agrikultura nian husi governu hatudu katak produsaun agrikultura kontinua tun. Ita nia merkadu sira nafatin domina husi ai-han importadu, no mal-nutrisaun kontinua sai problema boot (haree dadus). Produsaun foos kontinua tun maski durante ne’e governu tau atensaun boot liu ba parte ne’e, liu husi investimentu maka’as ba iha irrigasaun eskala boot hodi fornese bee ba natar sira no mós distribui tratór rihun haat resin ba agrikultór sira. Governu rasik rekoñese ona katak ho kondisaun ne’e Timor-Leste sei susar atu atinje nia tarjetu autosufisiensia ai-han iha tinan 2030. Polítika orsamental governu Timor-Leste nian la buka atu responde ba situasaun difisil iha setór agrikultura. Investimentu estadu nian ba setór Agrikultura tun ba beibeik. Ida ne’e refleta iha Alokasaun Orsamentu Jerál Estadu ba setór Agrikultura no Peska dezde 2015 to 2018 ne’e. Iha tinan 2015 Alokasaun orsamentu ba setór agrikultura mak tokon $34.457, iha 2016 tun ba tokon $24.826, iha 2017 tun tan ba tokon $21.962, no iha 2018 ne’e tun ba $14.679. HASATIL preokupa tebe-tebes ho tendénsia negativu ida ne’e no la refleta prioridade ne’ebé haktuir ona iha Planu Estratéjiku Dezenvolvimentu Nasionál 2011-2030. Bazeia ba tema loron mundiál ai-han ba tinan ida ne’e kona ba Promove Ai-han Lokál Nutritivu hodi Hakotu Hamlaha no Malnutrisaun iha 2030, HASATIL hanesan mós membru KONSSANTIL husu ba Governu tenke fó atensaun maka’as no investe ba promove produsaun ai-han iha rai laran no promove produtu ai-han lokál, hortikultura, produtu peska no pekuaria inklui ai-han indigenous no ai-han fuik sira ne’ebé eziste nanis ona iha Timor-Leste, tanba iha valor nutrisaun di’ak liu ba ema, saúde, ambiente no ekonomia rai laran. Hasatil mós preokupa tebes ho programa ajuda ai-han (McGovern Dole Food Aid for Education Program) Estadu Unidus Amérika nian, ne’ebé sei hafó sá sira nia influensia iha TL no iha tempu hanesan fó impaktu ba merkadorias produtu lokál iha rai laran. Kritéria prinsipál husi programa ne’e mak hanesan, ai-han ne'ebé atu ajuda ba nasaun tarjetu sira maioria tenke hola iha Estadu Unidus, tenke transporta iha ró ho bandeira Estadu Unidus nian. Maski programa ne'e ho objetivu katak ajuda ai-han ba komunidade, liu-liu ba eskola sira, kritéria ne'ebé programa ne'e aplika, sei fó benefísiu boot liu ba programa ne'e nian (ba Estadu Unidus Amerika) no bele fó impaktu negativu boot liu ba nasaun ne'ebé simu ajuda ai-han ne’e. 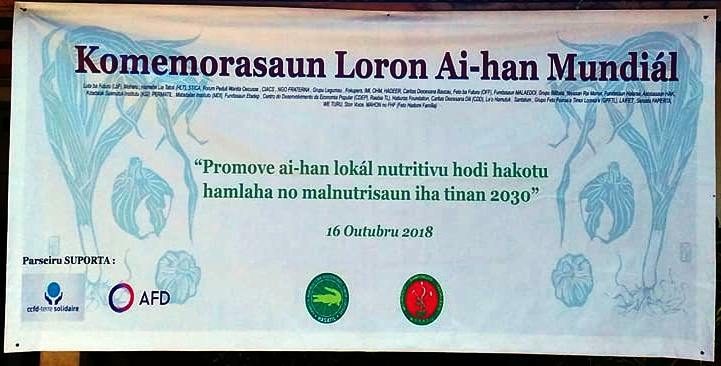 Informasaun preliminaria husi departamentu agrikultura Estadu Unidus nian hatudu katak Care Internasionál mak sei implementa programa Food Aid ne’e iha Timor-Leste ho total valor osan tokon $26. Ami hakfodak katak Care sei sai implementador ba programa Food Aid Estadus Unidus Amerika nian. Ami hanoin katak pratika ne’e klaramente la tuir Care nia Food Aid policy rasik, ne’ebé rekoñese katak programa sira hanesan ne’e fó impaktu la di’ak ba nasaun ne’ebé simu. Ami husu ba organizasaun internasionál sira, atu labele sai implementador ba programa ida ne’e, bainhira laiha estudu ne’ebé prova katak sei laiha impaktu ba agrikultura no seguransa ai-han iha rai laran. Ikus liu, HASATIL hanoin katak, programa agrikultura sira mós tenke fó benefísiu hanesan ba feto no mane agrikultór, no maximiza agrikultór feto sira nia partisipasaun no kontribuisaun ba produsaun agríkola. Investimentu barak too oras ne’e foo benefísiu boot liu ba mane sira, en termu de hakmaan agrikultór sira nia servisu. Fó prioridade orsamentu ba promove hortikultura, hakiak animal no hakiak ikan iha nivel uma kain hodi prodús produtu ne'ebé saudável no nutrisaun di’ak ba família, atu hamenus mal-nutrisaun, no ajuda ekonomia família nian. Husu ba Organizasaun internasionál sira atu labele sai implemetador ba programa Food Aid ne’ebé sei estraga agrikultura lokál no hafraku Timor-Leste nia rezilensia seguransa ai-han ba tempu naruk. Husu ba Ministériu Edukasaun, Agrikultura no Saúde atu la bele simu implementasaun programa Food Aid iha Timor-Leste. Konstrui irrigasaun eskala-kiik iha nivel aldeia no suku hodi fornese bee ba atividade produsaun iha nivel uma kain. Presiza mós estabelese sistema kolleita bee no Konservasaun bee iha area sira ne’ebé bee menus. Promove diversifikasaun ai-han no konsiensilizasaun hodi muda kultura Han, nudár dalan ida hodi hamenus importasaun iha Timor-Leste. Tau matan no halo avaliasaun kritiku ba projetu ajénsia internasionál sira iha Timor-Leste atu labele hamosu problema tempu naruk ba Timor-Leste bainhira sira nia projetu remata. Hametin igualdade entre mane no feto iha asesu ba fasilidade, rekursu no oportunidade ba kapasitasaun. No mós maximiza partisipasaun no kontribuisaun feto sira nian iha etapa produsaun tomak. Promove agro-ekologia, uza rekursu lokál atu hasa’e produsaun liu husi dalan ne'ebé la estraga meiu-ambiente. Too ba ne’e de’it komunikadu imprensa. HASATIL no membru sira tomak prontu nafatin atu kontribui ba dezenvolvimentu ne'ebé promove agro-ekolojia no hametin soberania ai-han iha Timor-Leste. Viva Soberania Ai-han! Viva HASATIL! Viva Agrikultór no POVU Timor-Leste! Sperm whales. From Timor-Leste from Below, Episode 6. Considering recent moves by the Government of Japan in support of whaling, we are concerned that the issue may come up during the Japanese Foreign Minister’s visit to Timor-Leste which begins on 11 October. We wish to make clear our strong support for Timor-Leste remaining a sanctuary for whales and dolphins. As organizations committed to protecting the unique natural environment and valuable heritage of our beloved Timor-Leste, we note the Government’s strong support for marine ecotourism development and the protection of all marine life, as articulated in the National Strategic Development Plan, and in the Government’s recent Tourism Policy. We also recognize and support the Ministry of Tourism’s ongoing efforts (with partners) to lead and develop the marine ecotourism sector, through its whale and dolphin monitoring program, its work with local tour operators, eco-volunteer organizations and local fishing communities. In the latest Council of Ministers’ meeting, a “Development Plan for a Sustainable Economy of Marine Eco-Tourism in Timor-Leste” was presented, describing “a proposal to transform Timor-Leste so that it becomes a reference in dive tourism and whale watching in Southeast Asia” and including “the protection and conservation of all marine life.” While we do not yet know the details of this proposal and look forward to learning more, it seems to support our view that marine eco-tourism has serious potential, if properly protected. We strongly support the protection of our oceans and eco-tourism as part of plans for a more diverse and sustainable economy. 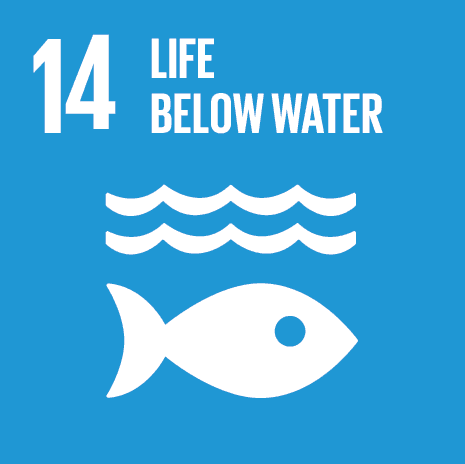 A large percentage of our population already depends on marine and coastal life for food, nutrition, and family income. If developed appropriately, building on the Government’s existing efforts, whale watching and eco-tourism have the potential to bring significant economic benefits to local communities. There is an urgent need to diversify our economy, to bolster and expand non-petroleum sectors such as agriculture and fishing, small productive industries and tourism. And these must be developed with a strong commitment to sustainable policies that will safeguard our fragile natural environmental heritage. Our territorial waters are already a sanctuary for whales and dolphins (see Joint Ministerial Order No.18/MAP/MCIA/II/2017, also English), and this offers a unique and special draw for tourists. 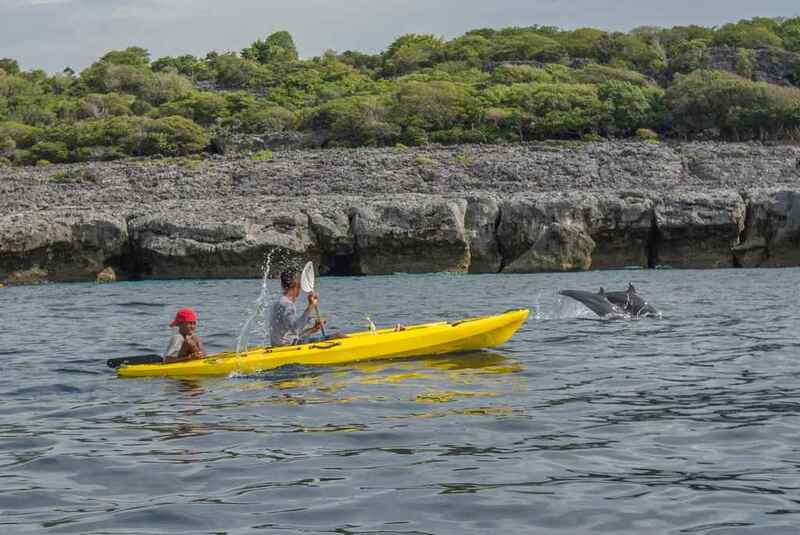 Recent articles by international academics and media point to Timor-Leste’s potential as a haven for eco-tourism, particularly for whale and dolphin watching. 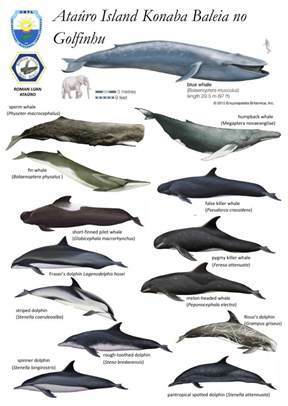 While limited, our waters are deep and hold within them an estimated 1/3 of all identified species of whales and dolphins (scientifically identified together as “cetacean”). 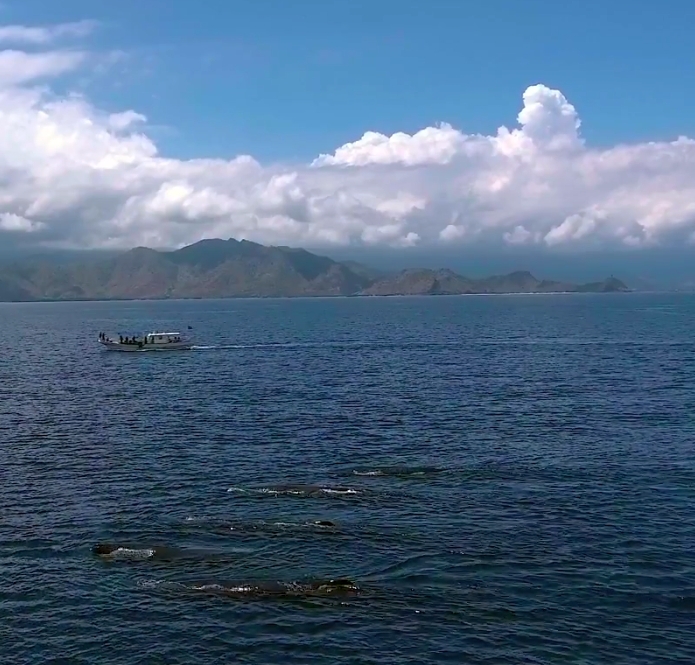 International media companies have already done extensive work highlighting and marketing Timor-Leste’s marine eco-tourism potential through photos and videos highlighting Timor-Leste as a perfect place to see blue whales on their southern migration, swim with sperm whales and see some of the highest concentrated populations of whales and dolphins in the world. 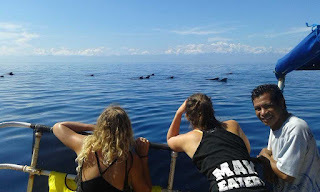 Whale and dolphin watching is recognized around the world as one of the fastest growing tourist sectors; there is also serious interest among marine biologists to study and photograph these beautiful mammals of the sea. Alongside our largely organic agricultural surroundings, permaculture gardens, beautiful beaches and vibrant coral reefs, whales and dolphins are part of our national treasure, marking Timor-Leste as unique in the world and increasing possibilities to bolster both national and international tourism. By comparison, Sri Lanka has built a strong tourism industry based around whale-watching, and the concentration of whales and dolphins there is far less than in Timor-Leste. Marine eco-tourism, however, can only flourish if we are able to manage our resources properly and protect our whales and dolphins from the various threats they face such as commercial hunting, shipping strikes and plastic debris entanglement and digestion. These threats, which according to international environmental groups like Greenpeace are increasing, were highlighted in the recent International Whaling Commission (IWC) meeting in Florianopolis, Brazil last month. The IWC was formed in 1946 and is currently made up of 89 member nations charged with the conservation of whales and management of whaling. In 1986, the IWC introduced a ban on commercial whaling, which is still in place. At this recent meeting, Japan introduced a highly controversial proposal, supported by 25 other members, which sought to remove the long-term ban, promoting instead a “coexistence” between conservation and commercial whaling. Following a bitter and heated debate, a majority of voting members rejected the Japanese proposal and confirmed the Florianopolis Declaration supporting the existing international ban on commercial whaling. Those defending this position say there is no need for endangering the whale population. At the recent IWC meeting, fellow CPLP member Brazil proposed a measure to create a whale sanctuary in the South Atlantic Ocean, but the proposal failed to secure the 2/3 majority it needed to pass. By maintaining our waters as a sanctuary for whales and dolphins, we not only protect our national treasure, but we also offer the world a unique and special place to see these creatures. As affirmed in Article 61.3 of our Constitution, "The State should promote actions aimed at protecting the environment and safeguarding the sustainable development of the economy." Timor-Leste has ratified the UN Convention on the Law of the Sea (UNCLOS 1982) which outlines state responsibilities for the management of marine resources, and we are a member of the International Maritime Organization (IMO). 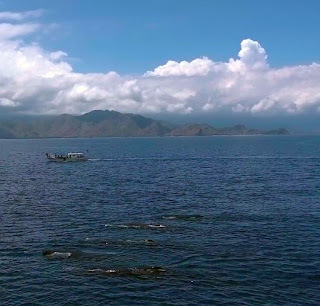 In 2007, Timor-Leste ratified the International Convention on Biological Diversity (CBD), and has since developed a National Biodiversity Strategic and Action Plan of Timor-Leste (2011-2020) which includes protection of our marine habitat. Timor-Leste’s globally significant marine biodiversity needs and deserves careful protection and restoration through new marine national parks and heritage areas. 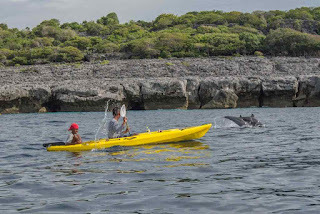 Our Government and Ministry of Tourism need to develop the important necessary regulations, infrastructure, tourism training, accreditation and baseline monitoring to ensure the development of a sustainable industry which will benefit local communities while also ensuring the protection of whales and dolphins. Timor-Leste must stand in solidarity with those members of the IWC who sought to protect whales and dolphins. We must oppose so-called “sustainable whale fishing” because there is in fact no such thing; Whales and dolphins are mammals, not fish, and are hunted, not fished. We need to ensure that our national policies counter the strong pro-whaling lobby. Together, we the undersigned commit to protecting our oceans, protected areas, whales and dolphins from those who threaten them. Signifika saida mai Timor-Leste? Signifika saida kona-ba kadoras? Semana kotuk, negosiadór husi Governu Timor-Leste ho kompañia mina internasionál ConocoPhillips konkorda katak Timor-Leste sei sosa ConocoPhillips nia partisipasaun husi Konsórsiu (Joint Venture) kompañia mina haat nian ne’ebé hetan kontratu atu dezenvolve kampu mina no gás Greater Sunrise. Bainhira sosa ho osan hamutuk tokon $350, Timor-Leste sei sai na’in ba 30% husi projetu ne’e, hamutuk ho Woodside (33%), Shell (27%) no Osaka Gas (10%). 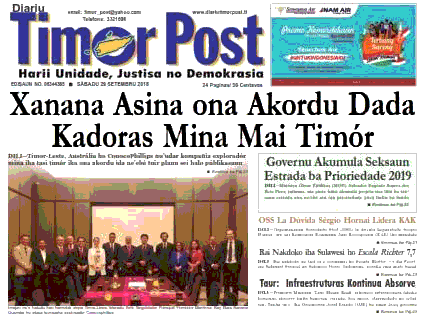 Se prosesu sosa ne’e liu husi TimorGAP nudár Timor-Leste nia kompañia mina nasionál, TimorGAP sei partisipa iha prosesu foti desizaun ba projetu, iha responsabilidade atu kontribui 30% husi investimentu, no iha direitu atu simu 30% husi projetu nia lukru. Artigu ne’e sei responde ba konfuzaun balu no informasaun laloos ne’ebé sirkula iha Timor-Leste no media internasionál kona-ba sosa partisipasaun no Projetu Sunrise. La’o Hamutuk akompaña asuntu ne’e iha tinan barak nia laran. Ami publika livru Sunrise LNG iha Timor-Leste, Mehi, Realidade no Dezafiu iha 2008, no ami kontinua enkoraja desizaun hirak ne’ebé bazeia ba faktu no loloos ne’ebé klaru atu responde ba povu Timor-Leste nia interese. Ami hein katak artigu ida ne’e sei ajuda imi hotu atu kompriende aspetu legál, ekonómiku, sosiál no ambientál husi projetu ne’e, ne’ebé potensiálmente lori benefísiu signifikante ka lakon boot ba ita nia povu. Atu fó hanoin katak, buat importante liu bainhira halo desizaun la’ós atu manán kadoras ka manán opiniaun husi nasaun seluk no kompañia sira, maibé saida mak sei sai benefísiu liu ba povu Timor-Leste iha tempu naruk. Kampu mina no gás iha tasi okos Greater Sunrise deskobre iha 1974, maibé seidauk dezenvolve tanba okupasaun Indonesia, disputa ba fronteira maritima ho Austrália (ne’ebé foin lalais mak rezolvidu), no seidauk iha konkordánsia kona-ba prosesu gás sei halo iha ne’ebé. Analista balun estimatiza katak mina no gás iha Greater Sunrise sei fa’an ho folin hamutuk biliaun $50. Hafoin selu ba investimentu kapitál, kustu operasaun no kompañia nia lukru, Timor-Leste bele hetan reseita husi impostus no taxas ba produsaun biliaun $8-20. Se karik Timor-Leste sai na’in sorin balu, ita sei fahe osan lukru, no mós hetan responsabilidade ba investimentu. Iha tinan barak nia laran Sunrise nia projetu paradu tan de’it Governu Timor-Leste insiste katak kadoras husi gás natural tenke kanaliza mai Timor-Leste hodi gás hirak ne’e sei sai malirin liu no sei hafoin nabeen transforma ba LNG (Liquefied Natural Gas) nune’e bele hatama iha ró tanke boot sira no bele fa’an ba konsumidór sira iha rai li’ur. Maske nune’e, kompañia mina haat iha Konsórsiu fiar katak meius ba produsaun LNG – liuhosi kadoras ba Australia (Darwin LNG ka DLNG) ka uza plataforma namlele (Floating LNG) – sei fó lukru ne’ebé barak liu no nia risku sei ki’ik liu. Governu Timor-Leste fiar katak kriasaun servisu lubun, kontratu no dezenvolve ekonomia lokál husi projetu Tasi Mane iha Kosta súl sei lori kompensasaun aas liu fali kustu no risku husi lori gás mai iha ne’e, Governu Australia, Konsórsiu Sunrise nian, no Komisaun Konsiliasaun ONU ne’ebé fasilita Tratadu Fronteira la iha fiar ne’e hanesan Governu Timor-Leste. La’o Hamutuk no peritu hirak ne’ebé ami konsulta tiha ona la konvensidu katak benefísiu ba Timor-Leste sei boot liu fali nia kustu, no ami ezije beibeik ba jestór husi projetu ne’e atu fahe dadus no asumsaun sira ne’ebé mak halo sira sai optimístiku tebes ba projetu ne’e. Tuir regulasaun Konsórsiu Sunrise nian, parseiru idak-idak - Woodside, Shell no Osaka Gas - iha direitu atu “pre-empt” entidade ne’ebé atu sosa. Signifika katak se ConocoPhillips hakarak atu fa’an ninia partisipasaun, kompañia ida husi kompañia hirak ne’e bele sosa fali atu prevene interese ne’e monu fali ba entidade seluk nia liman. Notísia iha mídia indika katak Woodside karik uza podér ida ne’e, no bele prevene Timor-Leste atu sosa partisipasaun husi ConocoPhillips. Timor-Leste sei presiza selu 30% ba leten husi kustu kapitál atu dezenvolve kampu Sunrise, ne’ebé sei aumenta dolares biliaun balun. Investimentu ne’e la’ós de’it ba kadoras no planta LNG, maibé mós ba perfurasaun ba posu sira hodi halo peskiza no produsaun, harii infrastrutura atu prosesa mina no gás iha kampu (karik inklui mós prosesamentu namlele (Floating Production Storage and Offloading Vessel, armazenamento iha ró ne’ebé lori atu rezerva no fa’an mina husi Sunrise), infrastrutura operasionál, no ba kustu sira seluk. Karik osan hirak ne’e mai husi empréstimu, Timor-Leste tenke selu fali ho tomak osan inan ho nia funan. Mezmu ema hotu espera katak investimentu ne’e sei rekupera fila fali hafoin kampu ne’e komesa prodús iha tinan 6-12, osan hirak ne’e tenke selu lalais, no laiha serteza atu rekupera. 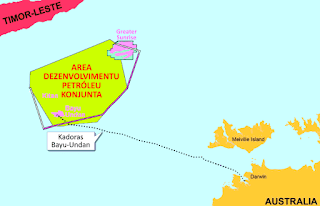 Indústria petróleu nudár indústria ida ho lala’ok segredu no projetu boot sira ne’e iha mundu tomak, ne’ebé inklui mós selu rihun atus dolar too dúzia husi entidade, dala barak sei fó fatin atu mosu korrupsaun. Hafoin Timor-Leste sai na’in ba Sunrise, ita nia nasaun no osan sei sai maninga ba na’ok-teen no bosok-teen sira ne’ebé hakarak sai parte husi asaun, no ita mós karik sei selu barak liu fali duké saida ita espera atu selu. Ho projetu boot no kompleksu hanesan ne’e, Timor-Leste presiza atu implementa ho transparénsia, iha supervizaun, akontabilidade no kontrolu no balansu de podér durante ninia implementasaun Ita seidauk iha protesaun di’ak ne’ebé presiza, no ita tenke dezenvolve lalais. Nudár sumáriu, ema hotu iha Timor-Leste presiza iha serteza katak viajen ba tempu naruk ida ne’e mak sei lori ita ba hetan fatin di’ak. Timor-Leste hasai tiha ona maizumenus tokon $250 ba projetu Tasi Mane, no barak liu ba aeroportu Suai no Auto-Estrada Suai-Fatukai. Ita agora sei gasta tan tokon $350 liu atu sosa ba iha Greater Sunrise, ne’ebé tuirmai sei hasai tan biliaun lubun ba preparasaun atu hasai mina no gás. Karik ita sei hasai biliaun $5 too $10 atu dezenvolve restu husi projetu Tasi Mane. Se bainhira ita foti desizaun ne’ebé sala ohin loron, sei difisil atu muda iha futuru, no ita bele kontinua fakar osan ba buat hirak ne’ebé la lori lukru barak, ka tau fini ba aifuan ne’ebe sei la lori fuan barak. What does it mean for Timor-Leste and the Pipeline? An updated, longer article on this topic is on our website. Last week, negotiators from the Timor-Leste government and the ConocoPhillips international oil company agreed that Timor-Leste will purchase ConocoPhillips’ share in the Joint Venture (consortium or JV) of four oil companies who hold the contract to develop the Greater Sunrise oil and gas field. By paying $350 million, Timor-Leste will become the owner of 30% of this project, together with Woodside (33%), Shell (27%) and Osaka Gas (10%). If the sale goes through, TimorGAP, as Timor-Leste’s national oil company, will participate in making decisions about the project, be responsible to contribute 30% of the investment, and be entitled to 30% of the profit. 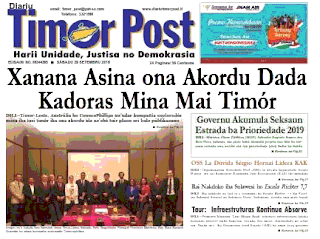 This article will address some confusion and misinformation that is circulating in Timor-Leste and international media about the purchase and the Sunrise project. La’o Hamutuk has followed this issue for many years (we published the book Sunrise LNG in Timor-Leste: Dreams, Realities and Challenges in 2008), and we continue to encourage fact-based, objective decisions to serve the best interests of Timor-Leste’s people. We hope that this article will help you understand legal, economic, social and environmental aspects of the project, which has the potential to bring significant benefits or huge losses to our people. Decisions should not be primarily motivated by “winning” a pipeline or overcoming the opinions of countries and companies, but by what will give the most benefit to Timor-Leste’s people over the long term. The Greater Sunrise undersea gas and oil field was discovered in 1974, but it has not yet been developed because of the Indonesian occupation, the (recently resolved) maritime boundary dispute with Australia, and disagreement about where the gas should be processed. Some analysts estimate that its gas and oil will sell for about $50 billion. 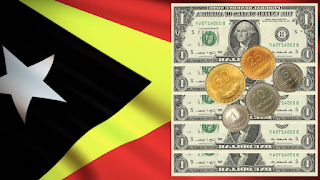 After paying for capital investment, operating costs and company profit, this could generate $8-20 billion in tax and royalty revenue to Timor-Leste. If Timor-Leste becomes a part-owner, we will share in the profits, as well as in the responsibility for investment. For many years, Sunrise has been stalled because Timor-Leste’s government has insisted that its natural gas be piped to Timor-Leste, where it will be cooled until it becomes a liquid (Liquefied Natural Gas – LNG) that can be loaded onto tanker ships and sold to overseas customers. However, the four oil companies in the Joint Venture believe that other ways of making LNG – either through a pipeline to Australia (Darwin LNG or DLNG) or on a floating platform above the field (FLNG) – will be more profitable and less risky. Timor-Leste’s government believes that spinoff jobs, contracts and local economic development on the Tasi Mane coast will more than compensate for the higher costs and risks of bringing the gas here, but this view is not shared by Australia, the Sunrise Joint Venture, or the UN Conciliation Commission that facilitated the Boundary Treaty. La’o Hamutuk and experts we have consulted are not convinced that the benefits to Timor-Leste are greater than the costs, and we have repeatedly asked the managers of the project for the assumptions and data that make them so optimistic. Last March, Timor-Leste and Australia signed an historic treaty to establish their maritime boundary, and it is pending ratification in both countries. La’o Hamutuk celebrates this achievement as a significant advance for Timor-Leste’s national sovereignty. Although the negotiators had hoped to resolve the Sunrise question before the Treaty was signed, they were unable to. Because Sunrise straddles the boundary established by the new treaty, Timor-Leste will receive 70% of the government revenues for extracting Sunrise oil and gas if the gas is processed in Timor-Leste, and 80% if it is processed in Australia. 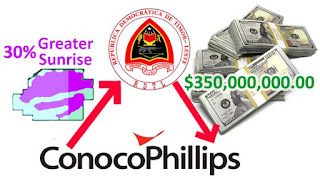 Timor-Leste’s purchase of ConocoPhillips' 30% share of Greater Sunrise is one step in a long process which may eventually bring a gas pipeline from the Sunrise field to Beaçu on the south coast. Many Timorese citizens are proud of our political leaders for persuading or paying Australia and the oil companies to accept this position. However, this issue has financial, economic, environmental and social consequences which could affect people’s lives for many generations, and will be longer-lasting and more consequential than temporary patriotic emotion. It is not yet clear that the Sunrise pipeline will be good for the people of Timor-Leste. The nation needs and deserves a detailed, objective analysis, with complete public information, about the costs, benefits, risks, and impacts of the entire Greater Sunrise and Tasi Mane projects before billions of dollars of public funds are disbursed to oil companies, contractors, brokers and other individuals and companies who don’t have any long-term commitment to the nation or obligation to serve the public interest. La’o Hamutuk has serious doubts that such an analysis will prove that the benefits of bringing the Sunrise pipeline to Timor-Leste are enough to justify its huge costs, risks and social impacts. But even if it does, the recent agreement to purchase ConocoPhillips’ 30% share is insufficient to ensure that the pipeline will come here. What else has to happen to bring the pipeline to Timor-Leste? Under the Sunrise Joint Venture rules, each other partner – Woodside, Shell, or Osaka Gas – has the right to “pre-empt” another buyer. In other words, if ConocoPhillips intends to sell its 30% share, one of these companies could purchase it to prevent it from going to someone else. Media reports indicate that Woodside may exercise this power, which would prevent Timor-Leste from buying the share from ConocoPhillips. Australian and Timor-Leste government regulators will have to approve the purchase. The sales contract and Joint Venture agreement must also be approved by the Council of Ministers and reviewed by the Audit Court. Timor-Leste will have to pay $350 million to ConocoPhillips early next year, sort of a down payment on much larger financial obligations in the future (see #5 below). The $350 million – more than twice as much as Timor-Leste spends each year to educate our children – will be taken out of the Petroleum Fund, probably as part of the 2019 State Budget which the Government will propose to Parliament in November. We hope that Parliament’s debate on the Budget will fully explore this issue, including financial and other obligations that Timor-Leste assumes by joining the Joint Venture. Even after Timor-Leste owns a 30% share of Greater Sunrise, it will need to persuade Shell and Woodside to approve a pipeline to Timor-Leste, which may reduce the profitability of the project. Most Joint Ventures require unanimous approval for a major decision like this one. ConocoPhillips wanted to process the gas in Darwin, perhaps because it is the principal owner of the soon-to-be-idle LNG plant there that has been processing gas from Bayu-Undan. They persuaded Shell and Woodside to support their position. Before that, the Joint Venture had preferred Floating LNG; Timor LNG was always the third choice for all the partners. Without ConocoPhillips, the Sunrise JV will have less financial resources and technical and administrative expertise, and other partners may ask for compensation to accept the increased cost and technical and security risks of a deep-water pipeline to a new LNG plant in Beaçu, as well as the additional infrastructure and regulatory support that it will require. Potential buyers for the LNG will also have to approve the development option and will want assurance that the price, continuity of supply, and security of operation meet their needs. Timor-Leste will need to pay at least 30% of the capital cost to develop the Sunrise field, which will be several billion dollars. This investment is not only for the pipeline and LNG plant, but for drilling exploratory and production wells, building the infrastructure to process oil and gas at the field (probably including a Floating Production Storage and Offloading (FPSO) vessel to store and sell oil from Sunrise), operational infrastructure, and other costs. If this money is borrowed, Timor-Leste will have to pay it back with interest. Although everyone hopes that this investment can be recovered a few years after the field starts production in 6-12 years, the money will need to be paid up front, and recovery is not certain. After the partners and governments agree and the capital investment financing has been secured, the Joint Venture has to design and build the project, subject to regulatory and environmental approval and best practice. The oil and gas industry has caused pollution, spills, accidents, fires and explosions all over the world, and we need to take appropriate measures to protect our beloved country. Nothing anywhere near this scale has ever been built in Timor-Leste, and virtually nobody here has ever experienced the potential environmental disasters it comes with. Our regulatory agencies and environmental authorities do not yet have the knowledge, understanding, or perspective to manage a project like this, and they often find it difficult to stand up to political pressure. Although this scientific and administrative capacity could be developed over time – with support from people who have already had major responsibilities on similar projects – the learning curve is long and the consequences of mistakes are huge. “Learning by doing” is not acceptable when billions of dollars and thousands of lives are at risk. The oil industry is secretive by nature, and projects of this magnitude all over the globe, involving payments of hundreds of millions of dollars to dozens of entities, are often riddled with corruption. After Timor-Leste becomes an owner of Sunrise, our country and our money will be a magnet for thieves and scammers who want a piece of the action, and we may end up paying much more than we should or expect to. With a project of this size and complexity, Timor-Leste needs to implement transparency, oversight, accountability, and checks and balances all along the way. We do not yet have the necessary safeguards in place, and we need to develop them immediately. In summary, everyone in Timor-Leste needs to be certain that this long journey is one which will lead to a good place. Timor-Leste has already spent more than $250 million on the Tasi Mane project, mostly for Suai airport and the Suai-Fatukai highway. We are about to spend $350 million more to buy into Greater Sunrise, to be followed by several billion to prepare to extract its oil and gas. We may spend another $5-$10 billion to build the rest of the Tasi Mane project. In other words, the country will spend most of our $17 billion Petroleum Fund – which finances education, health care, roads, water, electricity, veterans, PNTL, F-FDTL and many other things – to pursue the gas from Greater Sunrise. It is not too late to seriously consider its costs and benefits, and to see if the petroleum path is the most promising, practical and productive way to use the nation’s finite economic resources. Should we invest our time, money, political capital and administrative skills in the Sunrise and Tasi Mane projects – or should we take the more certain, less dangerous path of diversifying our economy, building on our human and agricultural resources? If we make the wrong decision now, it will be even harder to change course in the future, and we may continue to throw good money after bad.